Quickly and easily view live streaming or recorded video - from one camera or many - on your phone, tablet, watch or computer. Whether you want to keep an eye on your kids, your pets or your driveway, we’ve got you covered. Our friendly experts can help you find just what you need. Know who’s at your door in an instant. Talk, listen and record it all. Add smart locks and you’ll be able to let them in or keep them out. A security camera is only as good as the platform it runs on. Our smart system, powered by Alarm.com, uses artificial intelligence to identify whether moving objects are vehicles, animals or people. The app is simple, yet robust. See what you want, when you want it. Quickly and easily. Our experts can help you find the perfect camera combination for your home or business. 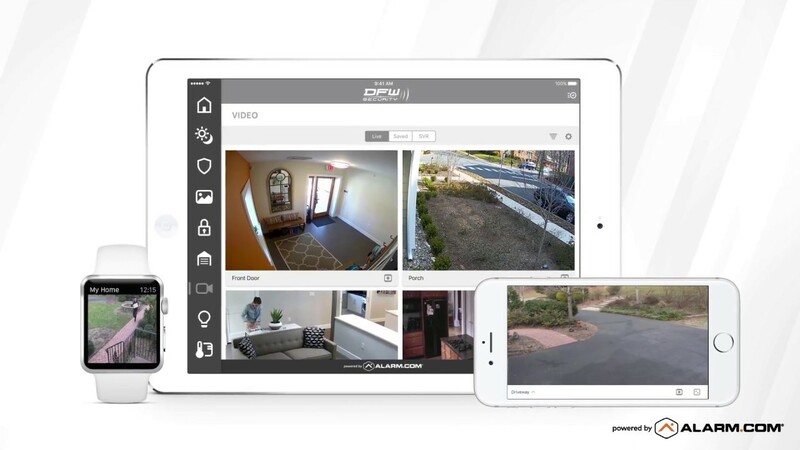 View a live video feed anytime from your phone, tablet, watch or computer. View multiple locations from one login. View multiple cameras on the same screen or separately. Record on demand while watching your live feed. Record video clips in response to motion, schedule or system events. Set it up to automatically record when doors open, when you’re out of the neighborhood, or only after midnight. Record when a car or person enters your driveway, but not when it’s a cat. Record footage from all cameras when an alarm occurs. Add an SVR (streaming video recorder) if you’re looking to record footage 24/7 in addition to smart clips. Quickly see what you missed. Our searchable library of clips makes it fast and easy to find what you’re looking for, whether you’re using your phone, tablet or computer. Want to know when the kids get home from school? Get a push notification with an attached video clip so you can see them get inside safely. Find out instantly when a package is delivered, the cleaning service arrives, or car enters your driveway. When the liquor cabinet is opened, the thermostat is adjusted or someone rings your doorbell, you’ll know exactly who did it. Avoid a flood of notifications with our video analysis service that distinguishes important events from routine activity. For example, get an alert when a vehicle stops outside your home, but not every time one drives past. If someone lingers by your front door, but not when the mail is delivered. When a deer enters your yard, but not a squirrel. Create virtual zones or tripwires to further target exactly what you want to see. Installing security cameras for the protection of your home and family is not the time for DIY. Let our professional licensed technicians set up and customize your cameras to help you get the most out of your smart home technology.